With my five-year-old starting to raid my jewellery box, these super cute necklaces could mark the start of her own grown-up collection! 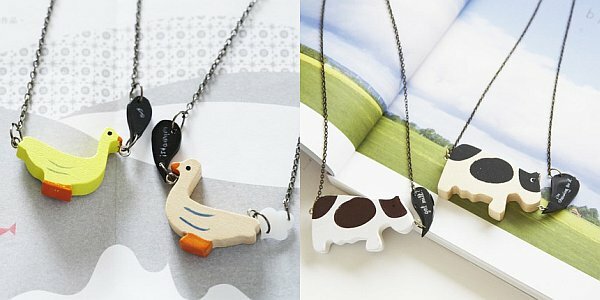 With a great range of beasties to choose from, Animal Farm Necklaces are created by Sydney-based Shupg. Made from wood with an antique finish chain, each animal has a witty speech bubble, so the cow says ‘I’m chewing on it’ and the cat says ‘Fish?’. Take your pick from dogs, elephants, horses, cows, cats or ducks – these really are charming and quirky. In fact I think these could look great on you or the kids! Each one costs US$28, plus local shipping.